Denny Breer's presentation at our club and reports from club members who went there made the Green a must-do on my list. When Green River veteran, Mary Nishioka, asked for a pair of club members to accompany herself and her daughter, Lauré, I swallowed the bait. Rounding out the foursome was Ken Rutherford. This was not quite my first time there. The Better Half, our main tax deduction, and I drove around the region for a summer family vacation. We rented a raft with rowing gear with the intention of taking turns rowing and fishing. The wind proved too strong for either of the ladies to control the raft, so just about the only fishing was done at the take-out at the end of Section A. I caught a mess of fish in the twenty minutes till the shuttle driver arrived. I put it in my mind to come back to this place. 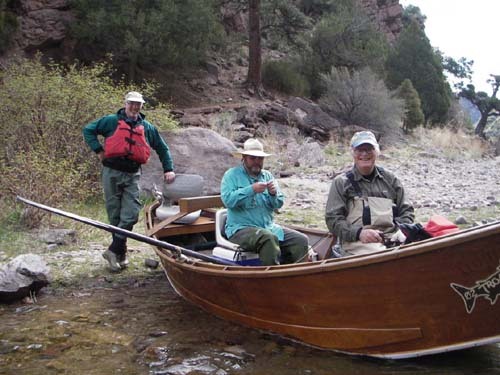 The reclusive, exclusive, not very effusive Doug Burton guided one boatundefineda handsome wood craft, the only on the riverundefinedand Darren Bowcutt guided the other. We four sports shifted from boat to boat, from guide to guide, from bow to stern. 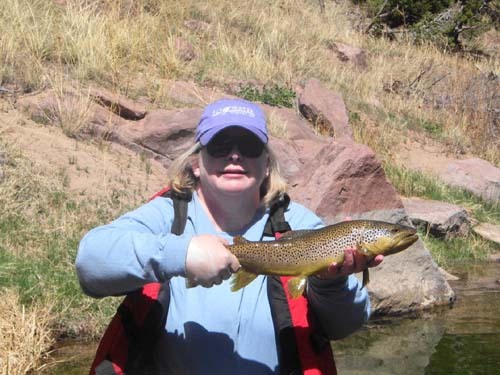 Except for one spate of determined effort on Mary's part, we all caught fish no matter what. I partially retract that; anybody on dry flies had a hard time. Our two guides rigged us with a nymph and a midge most of the time. The fish seemed to key on one fly, but not the same one every day. There were two interesting details of how the rigs were built. The indicators were balloons. Our guides blew them up to less than an inch in diameter. They floated, they did not get waterlogged, they didn't burst, they were very sensitive. Clever, effective, and festiveundefinedwhat else could one want? The second detail was how Doug Burton tied on the point and dropper flies. He folded the length of tippet material into two strands and tied the resulting two strands with the leader in a blood knot. This resulted in two separate tippets coming from the blood knot. One tippet was cut shorter than the other, then the point and dropper flies were tied on. A bit of splitshot on the longer section completed the rig. At this point I'd like to refer you to Wayne Taylor's and Mary Nishioka's excellent previous articles for practical details about who, when, and where. Then come back here. 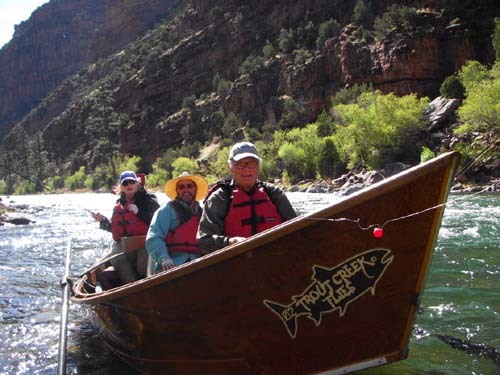 Mary's "The Green River and the Ladies from California"
Fishers without guides aboundundefinedsome on the shore and some afloat. There are a few in drift boats, quite a few in pontoon boats (river size, not lake size), one person plus canine first mate in an exquisite, varnished, lapstrake, rowing tender. Sightings of float tubers have dwindled to nil. Shore fishermen are advised to bring a rock to stand onundefinedI guess it gets crowded. If you want to try this great fishery, but find the price of guides prohibiting, by all means go fish it from the bank. There is great fishing, and you can get advice on flies at the shop/motel/restaurant or Denny Breer's Trout Creek Flies in Dutch John. When I go again, I'll probably do it afoot. Drag-free drift. Mend ... mend ... mend ... mend ... If you are with a guide, insert before most mends the gentle (or not) guide's command, "Mend". (After much practice, they can tell when you are about to mend, and jam the word in just before you were going to do it.) At irregular intervals the guide will subtitute, "Set". Save yourself some time and skip the denial phase; don't ask, "Was that a fish?". Move right on to the anger phase, and say, "Fiddlesticks, not again!". If your guide interrupts your scenery viewing to shout, "set, Set, SET", look deep into the water for your indicator. And no, the fish is not still on. The B Section seemed just like the A Section for quite a while, but the deep canyon melts away to steep hills. We had good action on the day we fished itundefinedfor me, equivalent to the days on the A. The fish seemed to fight harder. Darren told Ken and me that he likes the B during the summer grasshopper season. Splat a hopper along the bank. The lower portion of B is well suited to this fishing because deep grass grows right up to the riverbank. Mary caught the biggest fish, or was it Lauré? Ken and I vied for the smallest.